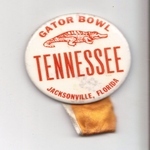 This is a large Colorado Gator Bowl pinback button and it is in good condition with some aging on the back. It is the 2 inch size. I do not sell reproductions and please if you have any questions or problems don't hesitate in contacting me. If you live near South Pittsburg, TN you are welcome to stop by and pick it up. This pin is in great condition and will make a great addition to any pin collection or TN Fans collection. It is a small 1 inch pin. Please don't hesitate to contact me with any questions. If you live near South Pittsburg, TN you are welcome to stop by and pick it up. 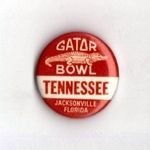 This is a large Florida Gator Bowl pinback button and it is in nice condition with some aging on the back. It is the 3 inch size. I do not sell reproductions and please if you have any questions or problems don't hesitate in contacting me. If you live near South Pittsburg, TN you are welcome to stop by and pick it up. 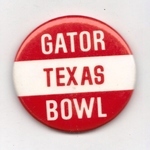 This is a Texas Gator Bowl pinback button and it is in good condition. It does have some a little foxing not seen in the photo. It is the 1 3/4 inch size. I do not sell reproductions and please if you have any questions or problems don't hesitate in contacting me. If you live near South Pittsburg, TN you are welcome to stop by and pick it up. 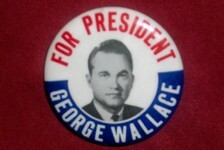 This is a 1968 George Wallace presidential election pinback button and it is in excellent condition. I have sold pins for over 20 years now so please don't hesitate in contacting me with any questions. I have several of these and they are coming out of the origonal box from the factory that was in Atlanta until it burn't in the 80's. If you live near South Pittsburg, TN you are welcome to stop by and pick it up. This is a DEPT 56 / ALL THROUGH THE HOUSE / "RUTHANN & BABY PATRICK" figurine. It is in excellent condition still having it's tag attached and will look wonderful in your home. There are no dings, pings, cracks or chips to be seen and truly is a heartwarming piece. It could be given as a gift. Either way it is a piece to be cherished. Box not included. I am selling this Vintage Porcelain Decanter Geisha Woman holding a Biwa, an ancient Japanese musical instrument. She is hand painted. The garment is beautiful and very detailed with gold trimming. The decanter seems to be old. Iâ€™m not sure of the year but Based on my research it may be from 1920s to 30s. It has the inscription at the bottom. The Mark may be from Okawachiyama Village in Imari, Japan. I based that on the inscription. It shows minor wear. The previous owner took very good care of her. On both sides of the head there is a bit of paint missing and there is some paint cracking right around that same area. 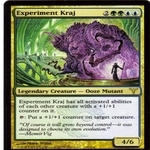 This seems to be a manufacture flaw. All in all it is a wonderful piece. Please contact me with any questions and if you live near South Pittsburg, TN you can come and collect her yourself once the auction is over. Thanks for stopping in and be sure to check back often. I have a good variety of items listed so far and will be constantly adding new items to my store. Have fun shopping. 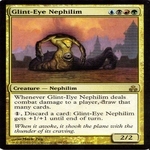 I only have one of these. This one is in excellent condition. Shipping is included in the price. 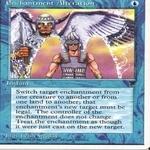 It is one of the first clear chrome cards and reads pat. pending on the back. Please contact me with any questions.